Leopard is a print that encapsulates timelessness and elegance with a pinch of zest. Incorporating hints of leopards into your wardrobe spices up your look in a matter of seconds! This transitional print can be worn at any age on any style of woman and should be. Animal prints are often associated with teenyboppers and Jersey Shore wannabe’s. Keep in mind that less is more when it comes to such a prominent print. Little touches here and there make much more of a statement than a literal interpretation. 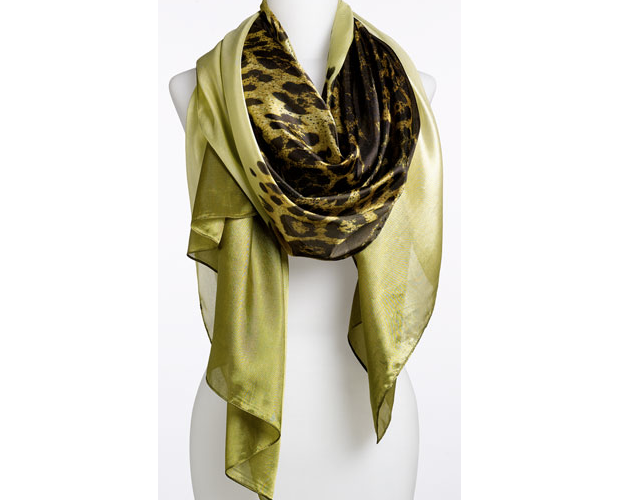 Try incorporating a leopard detail scarf into your current wardrobe. This is the perfect way to spice up a solid top and jeans for a stylish day of errand running. A scarf is also a great blazer accessory. Instead of your go to necklace spice up a neutral blazer with a gorgeous leopard scarf, professional yet fun. A leopard bangle is as easy as it gets when it come to incorporating this zesty print into your current wardrobe. A sparkly bangle adds instant interest and personality and will be a sure fire eye catcher! I am sure you are aware that leopard print shoes line every shelf of every store. If you love them but are doubtful that you could pull them off then try this half dipped stiletto from Nine West. I absolutely adore this shoe! Its classic shape and leopard/black color duo make it the perfect stepping-stone into the world of prints. Pair it with a classic black dress and tights or skinny jeans and your favorite blouse. This shoe will shine no matter the occasion! Leopard print has made its long awaited comeback and this time in classic colors, and elegant styles. Give this print a shot, I promise it will work and you will be glad when you do!